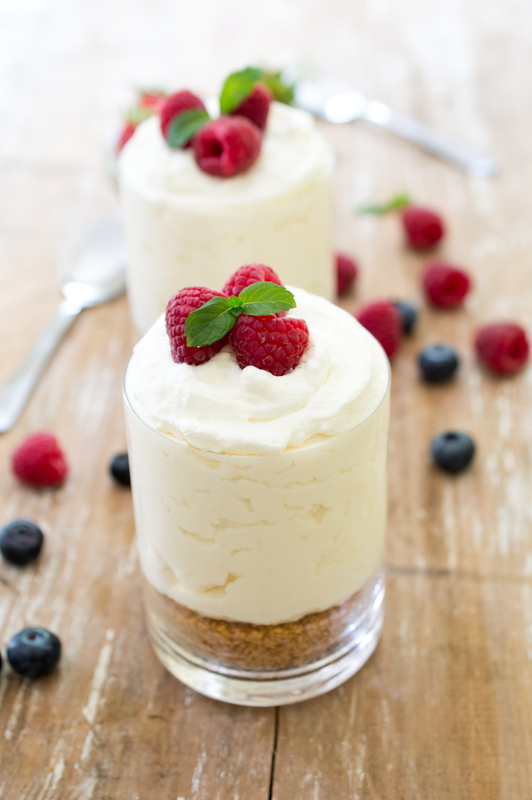 Individual No Bake Creamy Vanilla Cheesecake. A super easy no bake dessert that takes less than 15 minutes prep time and only 7 ingredients! Oh this cheesecake is gorgeous, Kelly! I just made a no-bake cheesecake too, as they’re my weakness! I love this vanilla flavor! 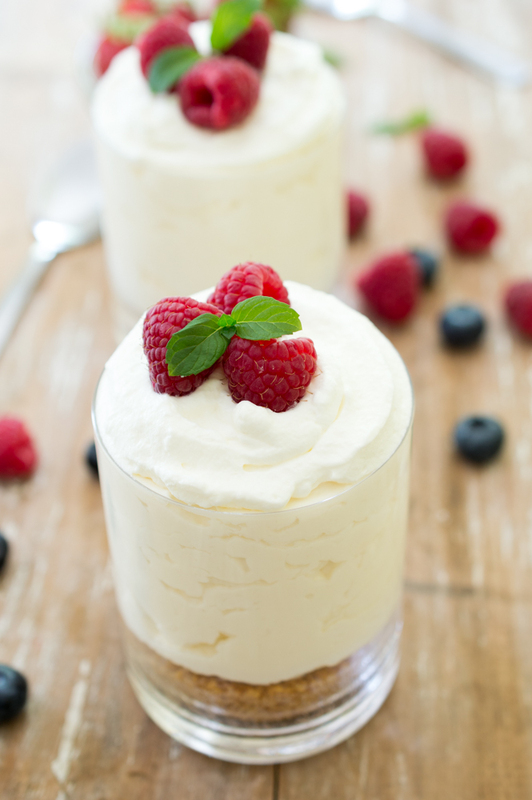 Love no bake desserts and these cheesecakes look amazing! Love the pictures! Pinned to try them! Yes please! 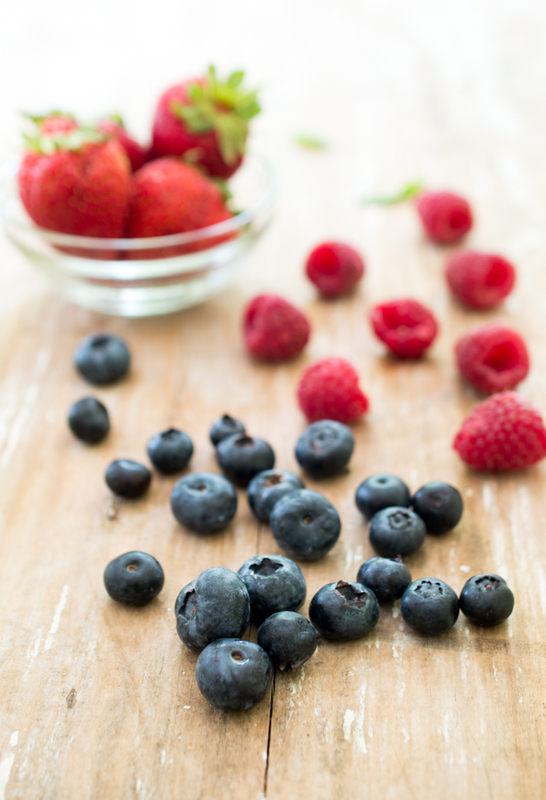 I love summer desserts that are no bake, because who wants to have the oven on when it is hot! Wow these cheesecakes are gorgeous! beautiful pictures too 🙂 Pinned these! No bake treats are a must here in Florida. It’s almost always hot. Who wants to have the oven on for an hour to bake something? 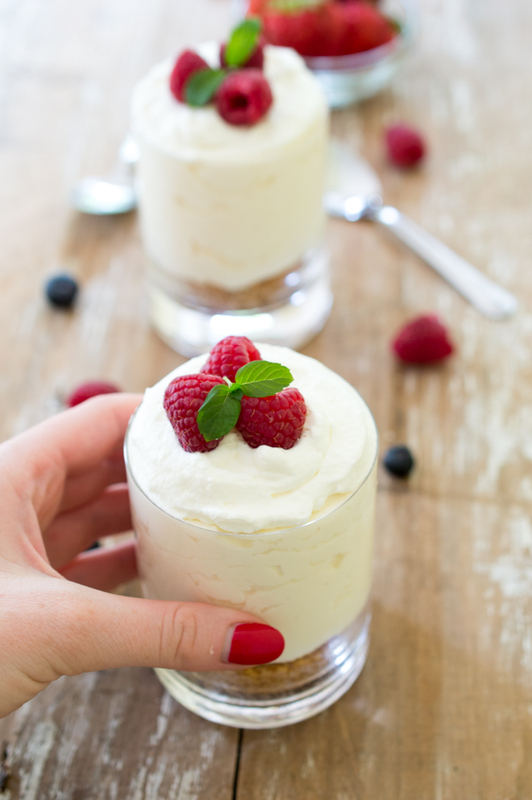 I love the simplicity of these no bake vanilla cheesecakes. They’re perfect, Kelley! I love no-bake desserts! This cheesecake is beautiful, Kelley! 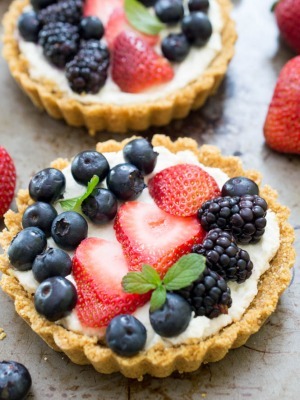 Vanilla is such a classic favorite and the pretty berries are just the perfect touch! In the summer months, anything no bake sounds good to me! These sound fabulous! This is my kind of dessert and perfect for summer! Gorgeous little individual cheesecakes! I didn’t try no bake cheesecake before, but I will try to prepare this as soon as I can, it looks lovely. I am throughing my parents a 65th birthday party in june and these no bake cheesecake dessert is something different for our sweet table. I was wondering could this dessert be made the day before and be kept in the fridge till the next day and could they stay out of the fridge on our sweet table for a long period of time. I am looking to make about a 100 of them. Yes they can definitely be made a day ahead! I would hesitate to leave them out of the fridge for too long. Maybe you can put some out in a shallow pan filled with ice and replace them as they go. I hope this helps and I hope you enjoy! I am looking forward to do this for my birthday party! When you talk about the large/small jars. Of how many ounces the jar should be? I think my jars are about 4 ounces each, so I don’t know if that’s the small you refer, or if the should be larger or smaller. My jars held about the same 4-6 ounces I think. I would say these are on the smaller end so I would do 4 of those jars in that case. I hope this helps and I hope you enjoy!! I don’t have a stand mixer. Would I have to whisk by hand? Yes you can absolutely whisk by hand. How many does this recipe make? Not servings but exactly how many? 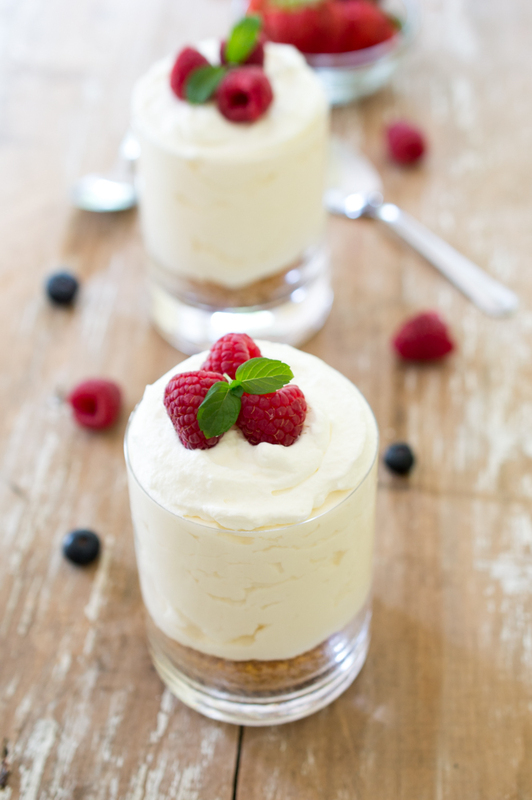 This recipe will make between 2 to 4 jars of cheesecakes depending on the size of your jars. Can these be frozen before thawing and serving? Yes you can freeze these after you make them and thaw before serving. Hope you enjoy! Cool. I want to find a good BAKE cheesecake. Plus, I dont have ring molds or a springform pan, so cannot make cheesecakes! What to do?????????????? Sorry for the confusion. The whipped heavy cream gets added to the cheesecake mixture. That is separate from the optional whipped cream for topping. I put extra whipped cream on top of mine for garnish. I think I maybe used 3 tablespoons on each one. Love this no bake idea! I had a fab recipe for Amaretto Cheesecake but after many uses I have lost part of it. I would love to know how I could incorporate the Amaretto into your recipe? This lost recipe had a custard Amaretto sauce in a gravy boat to pour over your slice if they wanted to do so. This part of the recipe I know how to do using egg yolks etc. I would try adding 1 tablespoon of amaretto liqueur and adding more to taste. Step 4 : “Fold in whipped cream…” – how much whip cream are we folding in? No problem! You want to beat the heavy cream until soft peaks form and this is the whipped cream that you will be folding in. I think it should be fine made in advance.